Two sets of stamps issued in 1858 in the Principality of Moldavia are counted as the first stamps of Romania. These stamps are extremely expensive, and there are an abundant number of forgeries on the market. In 1862 Moldavia and Walachia merged to one principality under the name of Romania. 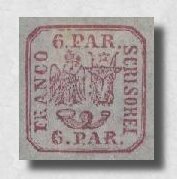 The picture above shows one of the first stamps issued after the union. The lands which today constitute modern Romania have a past filled with dramatic history. The geographic position of the country has led to a number of wars and occupations: The Roman conquest during the 2nd to 4th centuries; as gateway to Central Europe for the large migrations in the last half of the first millennium; as border province of the Ottoman Empire and as battlefield for the struggle for European power between first the Habsburg Empire of Austria, czarist Russia and the Ottoman Empire, later between Germany and the Soviet Union. Here you will find a summary of the major events of the History of Romania up to 1947, illustrated by stamps. Please note that these chapters contain preliminary information only. They do not have the same scope or quality as my Bulgarian pages.